Thank goodness, too, that he lifted his soup moratorium in the wintertime, which is perfect soup-eating weather. And yes, it is still winter here, or at least dreary and cold more often than not. I hear it’s practically summertime in California these days, but here in the Midwest, it’s still barely forty degrees. That still counts as soup weather, right? And this time around, I was craving something chock full of veggies. This soup (originally posted here) would fit the bill! 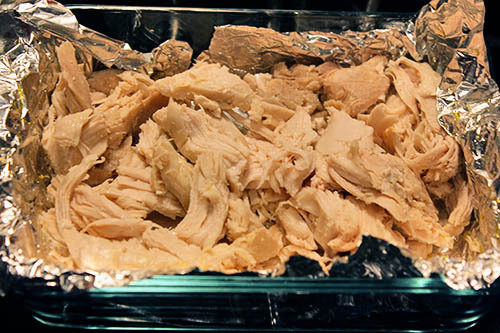 First: if you don’t already have shredded chicken, get a chicken breast baking. One of those boneless, skinless, half-pound numbers – you know the type. I would have preferred rotisserie, but that week I got to the grocery after they sold out. Sad face. Instead I just sprayed some foil with non-stick spray, wrapped it around a chicken breast, and tossed it in the convection toaster oven for thirty minutes. Second: start roasting them peppers. One poblano and one jalapeno! You’ve got a few possibilities for roasting the peppers... good to know, if you only have one oven and it’s baking the chicken. 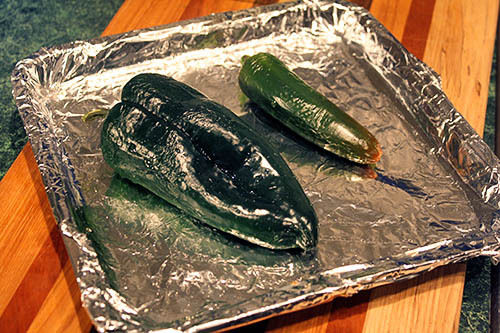 My preferred method is to roast peppers with the broiler setting in my toaster oven (which I always use instead of the large gas oven if I can). But I’d stuck the chicken in there to bake already... oops. I could have flame-roasted the peppers using grilling tongs over our gas burner (as I did here). And if I were really in a time crunch, I could’ve just cut them up and skipped roasting altogether. Options! 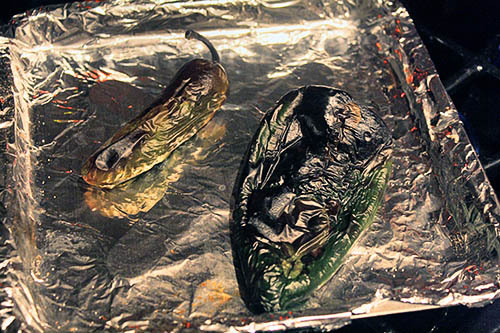 Instead I threw them under the broiler in our regular oven for about six minutes per side, until they looked super charred. I then covered them with plastic wrap and let them sit for ten minutes to cool. After that the skin peeled right off! Skin as wrinkled and thin as the foil... always a good sign. While the peppers were roasting and the chicken was baking, I got to work on the rest of the soup. 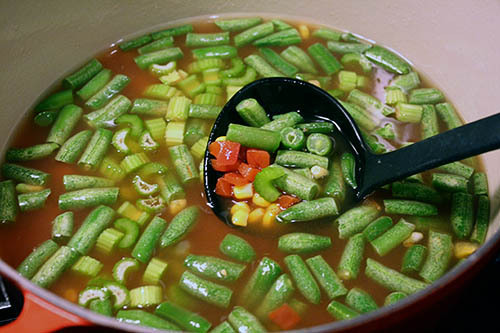 Compared to the chicken and peppers, this part is super easy: dump in 4 cups of chicken broth (I used one carton), 1 can of petite diced tomatoes with juice, one cup of frozen corn, one cup of green beans, and two stalks of celery, chopped into bite-size pieces. Side note: I recently discovered that my grocery sells individual stalks of carrots and celery. This is a game changer, people. I always avoided those ingredients because I hated having to find a use for the whole bag. Schnucks, you are rising in my estimation. Oh, and I should note that the original source also included a can of black beans and diced bell pepper. Those foods remain on Mr. P’s disliked-foods list, so I skipped them. But I think they’d be delicious if you added them in! 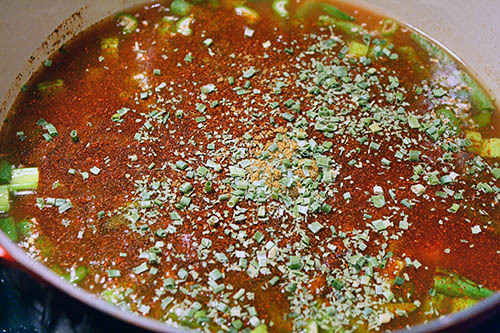 While I brought the soup to a simmer, I also added in the seasonings, which was a tablespoon each of minced garlic, dried minced onion, chili powder, and cumin (I really love cumin). I also added a squirt of lime juice and sprinkled dried cilantro and green onions over the top, without really measuring. Then I stirred it all together, brought it to just barely boiling, then covered the pot and reduced the heat to low. Meanwhile, how’s that chicken doing? Once it was baked through, I shredded it up into big chunks, then threw it in the soup. 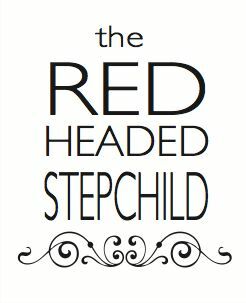 I also skinned, de-seeded, and diced up the roasted peppers before adding them in. 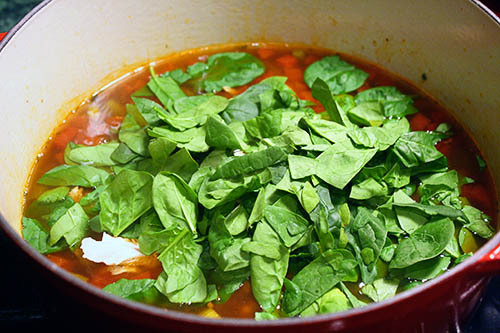 And one last ingredient: two cups of chopped spinach! There is so much green in this recipe, my recent major vegetable craving is almost alleviated. 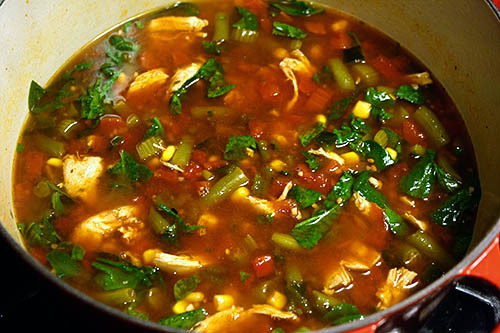 I didn’t time it, but I do think that the base of the soup (the broth and the veggies) ended up simmering for about thirty minutes while I cooked and shredded the chicken, roasted and diced the peppers, and chopped up the spinach. The corn, green beans, celery, and tomatoes were definitely cooked through, but if you’re not sure you’ve cooked it long enough, just pull out one of those veggies and perform the good ol’ nibble test to see if they’re done. I loved this soup, love love loved – enough to make it two weeks in a row. 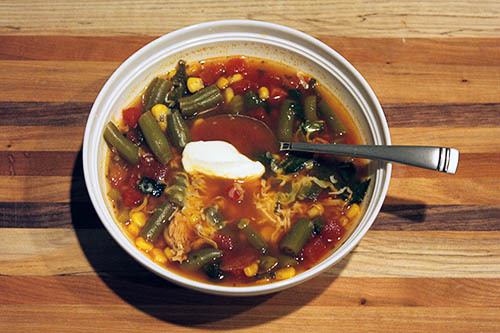 It provided all the comfort and flavor of a bowl of chili, but was lighter and healthier. Mr. P wasn’t as much of a fan... but remember, the guy is new to this whole enjoying-soup business. I also love the versatility of this soup – imagine it with beans in place of the chicken to make it vegetarian (sub in veggie broth for the chicken broth), or topped with avocado. YUM. If you’re still waiting for spring to show its face and stick around, this recipe should definitely work its way to the top of your meals-to-try list. Because believe it or not... this soup is almost making me sad to see winter go. And that is saying A LOT. Hope you enjoy!